New York is apparently moving fast to bridge the gap in the number of public monuments dedicated to men versus women. 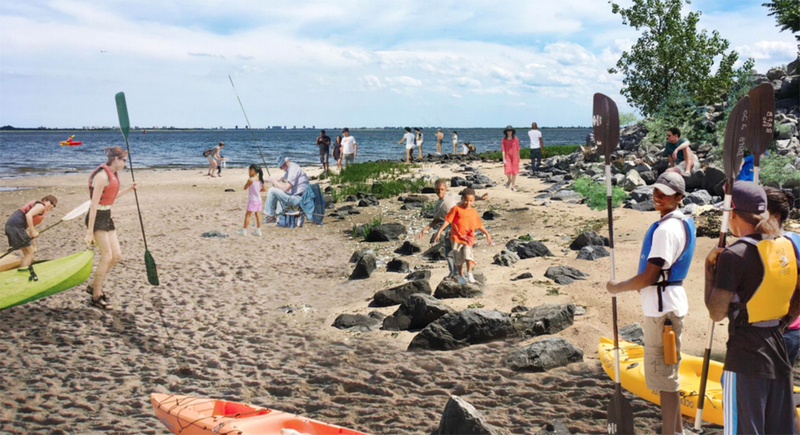 Last November, the She Built NYC initiative announced its plans to erect its first statue of the political trailblazer Shirley Chisholm and just yesterday, the group unveiled the top five artist proposals in the running for the monument's design. Among the all-female finalists are Amanda Williams and Olalekan Jeyifous, Mickalene Thomas, Tanda Francis, La Vaughn Belle, and Firelei Báez. 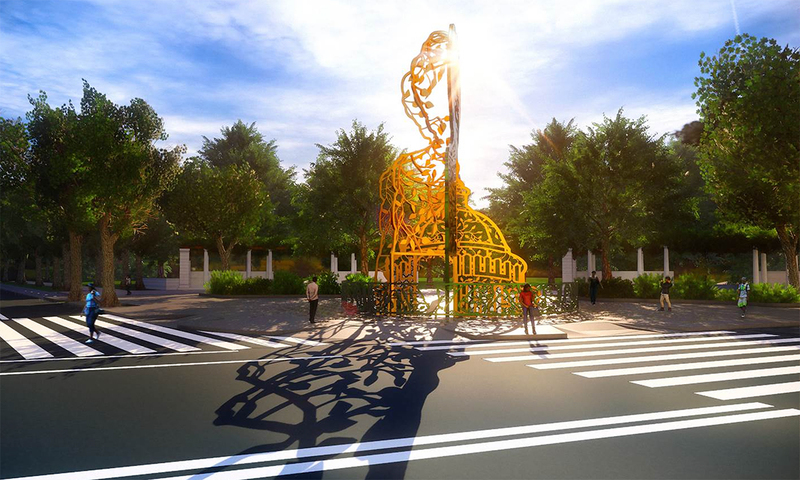 Slated for the Parkside and Ocean Avenue entrance of Brooklyn’s Prospect Park, the designs all feature grand visions of Congresswoman Chisholm’s “trailblazing” legacy. La Vaughn Belle Chisholm is well-known for the now-famous line: “If they don’t give you a seat the table, bring a folding chair.” Belle showcases Chisholm walking ahead of a sea of folding chairs, carrying one in her hand and stepping on what appears to be a symbolic presidential seal. The title of the piece, Chisholm Trail, alludes to her West Indian roots and how she empowered immigrants and people of all backgrounds by leaving a path for further equality in the United States. 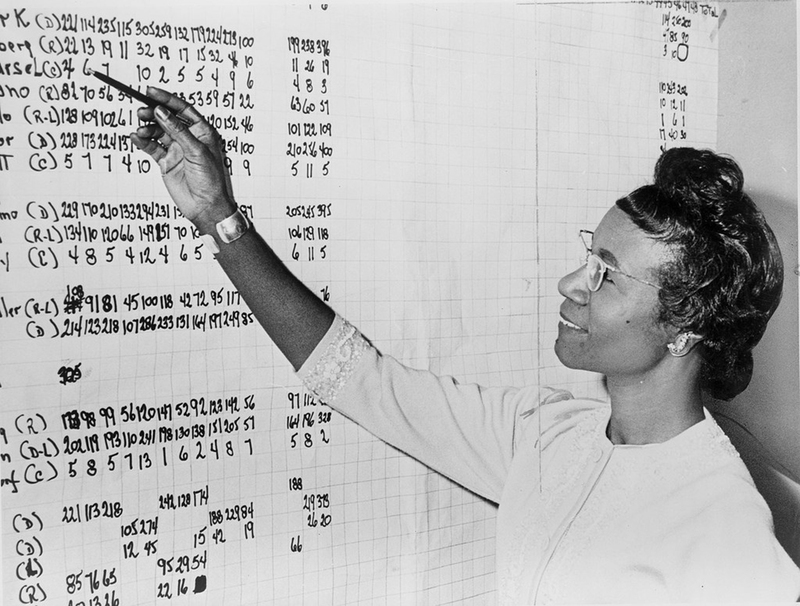 Mickalene Thomas Thomas described Chisholm in her proposal as someone who was “deeply in touch with the people” of Brooklyn. Her proposal shows the Congressperson sitting on a parked car, legs crossed as if in casual conversation, instead of at a podium or on a stage as a politician. Creating her figure at human-scale, the artist aimed to place her at eye-level with viewers in order to enhance engagement and encourage a communal atmosphere. “The monument is meant to highlight the fortitude of both Shirley Chisholm and the people she represents,” Thomas wrote in her submission. Amanda Williams and Olalekan Jeyfious Inspired by Chisholm's life as a civil servant—she was the first-ever woman and African American to seek the Democratic Party’s pick for president in 1971—Williams and Jeyfious envisioned the monument as a nod to Chisholm's legacy as someone who “left the door open” for others to pursue a place in politics and fight for equality. From one angle, the outline of the statue looks like the U.S. Capitol dome; from another, it’s Chisholm’s profile. According to the artists, this “symbolizes how she disrupted the perception of who has the right to occupy such institutions and to be an embodiment for democracy.” Tanda Francis The Chisholm Trail Memorial by Tanda Francis takes the form of a bold, bronze bust of Chisholm framed by vertical jets of water and light. A towering structure with her face looking upward in hope, the monument will feature a pathway surrounding the statue with Chisholm's inspiring quotes embedded into the sidewalk. Firelei Báez Báez’s monument centers around a series of 10- to 15-foot hand-painted metal columns. Inspired by the famous monument of Nelson Mandela in Howick, South Africa, the artist has created three portraits of Chisholm that reveal themselves when viewed from different vantage points. Each visage showcases different aspects of her public role and accomplishments. An aerial view of the sculpture reveals that the beams are arranged in the West African symbol of a bird, the Sankofa. The NYC Department of Cultural Affairs’ Percent for Art program has opened the proposals up for a public commentary period through Sunday, March 31. The winning design will be chosen in early April and is estimated to be built by the end of 2020. The Greenpoint Landing megaproject in Brooklyn has gained a duo of interlocking rental towers courtesy of OMA. 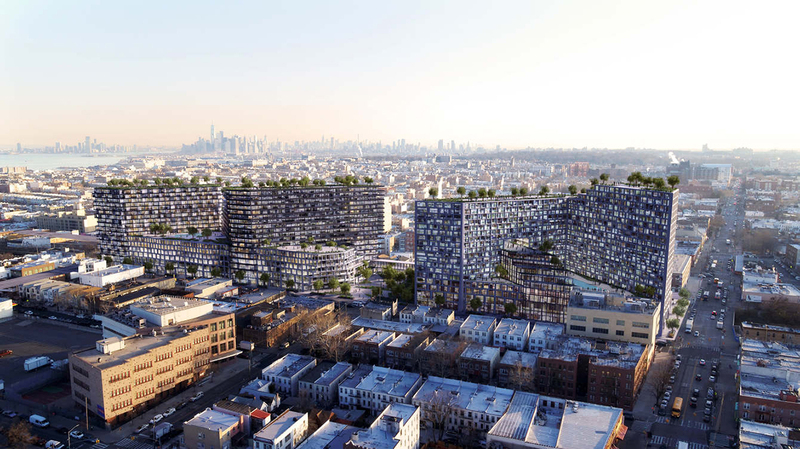 The ten-tower mixed-use development will ultimately bring 5,500 rental units to Greenpoint. Developer Brookfield Properties, who are bringing four towers to the development, and Park Tower Group have revealed the newest additions to the site, two leaning towers joined by a seven-story base. Other than the 745 rental units across both towers, 30 percent of which will be affordable, the project will expand the waterfront esplanade around the site by 2.5 linear acres. Other than the 768,000 square feet of residential space, the podium will also add 8,600-square-feet of ground-floor retail. The two towers will, as has become fashionable across the river in Manhattan, twist, turn, and part in the middle to reveal a wider view of the cityscape to the west. While the 300-foot-tall north tower will narrow as it rises thanks to a series of setbacks-turned-terraces, the 400-foot-tall southern tower will resemble a flipped version of its neighbor thanks to a series of cantilevers. 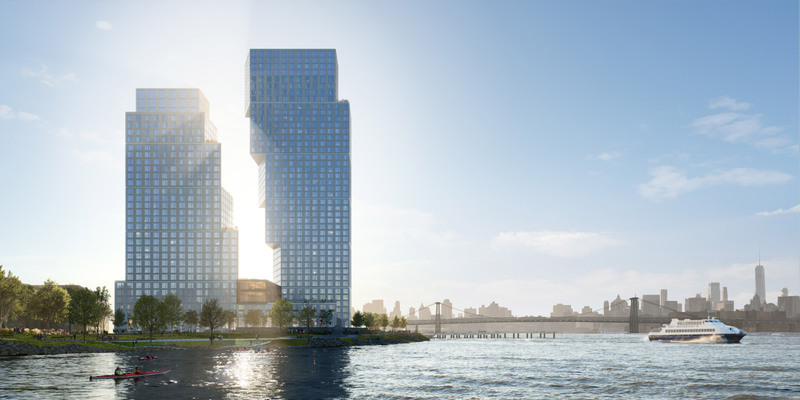 “Brookfield and Park Tower Group have been working together to connect Greenpoint with its waterfront,” said OMA partner and project lead Jason Long, “and we are thrilled to be collaborating with them on our first project in Brooklyn. We have designed two towers—a ziggurat and its inverse—carefully calibrated to one another. Defined by the space between them, they frame a new view of Greenpoint and new vista from the neighborhood to Manhattan.” Both towers will feature large windows and a facade of precast concrete carved with “slices” that alternate direction as each major section changes. The direction of the carvings are aligned with the sun’s relative position in the sky, ensuring that the light is dispersed over the building dynamically throughout the day. James Corner Field Operations will be designing the new waterfront landscape areas, while Beyer Blinder Belle will serve as the project’s executive architect. Los Angeles’s Marmol Radziner will be handling the buildings’ interiors. Construction on the project is expected to kick off in August of this year. Bjarke Ingels Group (BIG) has completed its move to Brooklyn, setting up shop in a new 50,000-square-foot office space only a stone’s throw from the Brooklyn Bridge. 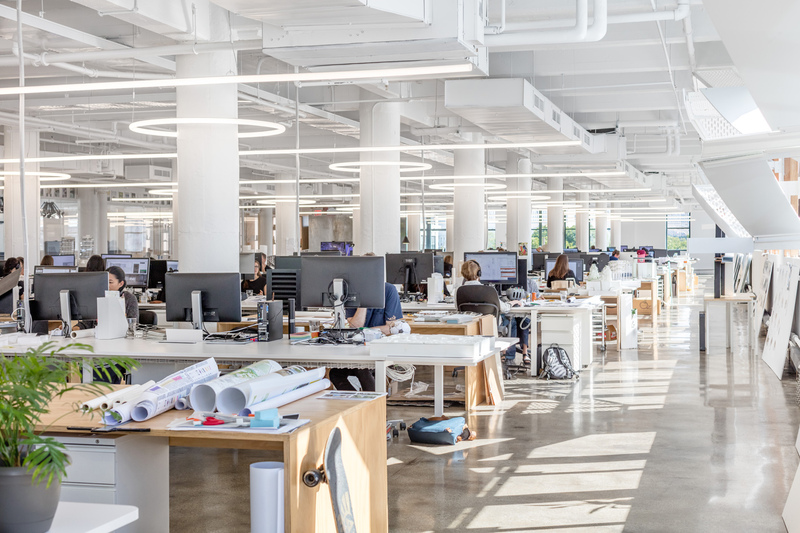 BIG has consolidated its 250-person office onto a single full-block floor near the top of 45 Main Street in DUMBO. Designed by BIG’s in-house interiors team, the office is full of furniture and lighting fixtures from the Danish design firm and frequent BIG collaborator KiBiSi. The move to a larger office meant that the studio was able to quadruple the space allocated to its two fabrication and assembly spaces. Completed pieces can then move to an extra-height, skylight-lit room for displaying large-scale models and mockup furniture. A gallery on the south side of the floor connects the office’s eastern and western wings. The chairs inside of the glass-enclosed conference room are color-coded in reference to the studio’s monograph Hot to Cold and range from mild to vibrant, a flourish repeated in the perimeter-lining bookshelves. Rounding out the new office’s perks is a private roof deck that the studio can use for events and conference meetings, which is separate from the building's 9,500-square-foot green roof designed by James Corner Field Operations. GRT Architects, a Brooklyn-based firm founded by Rustam-Marc Mehta and Tal Schori, has developed a classically inspired cladding template dubbed “Flutes and Reeds.” The off-the-shelf product is designed as a modular system of triangular concrete tiles that are arranged in varying increments and grid formats—imagine Gio Ponti’s midcentury Blu Ponti ceramic tiles with protruding elements. If the tiles are set in a conventional manner, they resemble the relative formality of Greco-Roman column detailing over an expansive triangular matrix. According to GRT Architects, “Greek columns can be thought of as modules or tiles in a way. Their proportions have fixed rules; there are options for surface embellishments, base and top details. From that small set of instructions comes literally centuries of architecture—from the most austere to the playful acts of virtuosity.” In effect, this straightforward classical detailing can serve as plug-and-play components for contemporary design. The tiles, as a result of their standardized size, can be rotated and arranged to create unique patterns or erratic islands across surfaces. In total, GRT Architects has designed more than two dozen tile variations for four standard patterns: Single Flute, Triple Flute, Single Reed, and Double Reed. 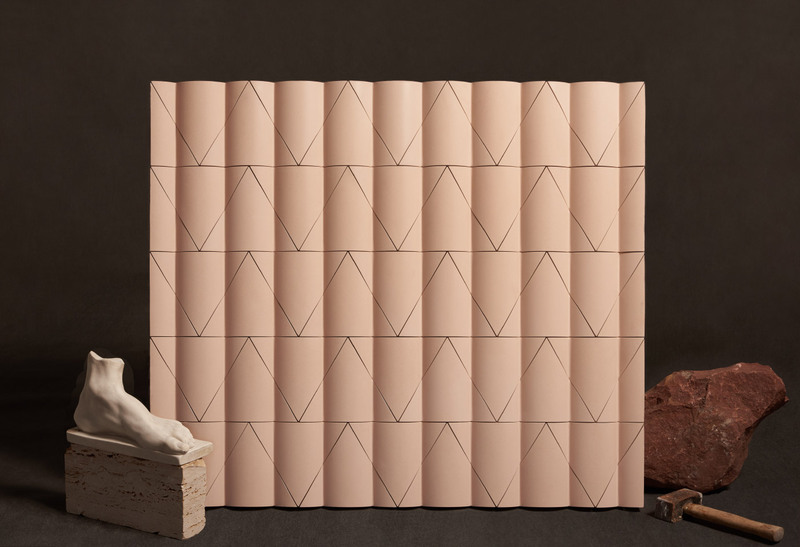 Over the last half year, GRT Architects has collaborated with Kaza Concrete—a Hungarian concrete manufacturer specializing in bespoke accent walls—to debut the product at both the Clerkenwell and Milan Design weeks. Kaza uses a mixture consisting of fiber-reinforced concrete, marble powder, and a broad range of powdered pigments. The mixture is subsequently poured into a cast to imprint detailing and harden. 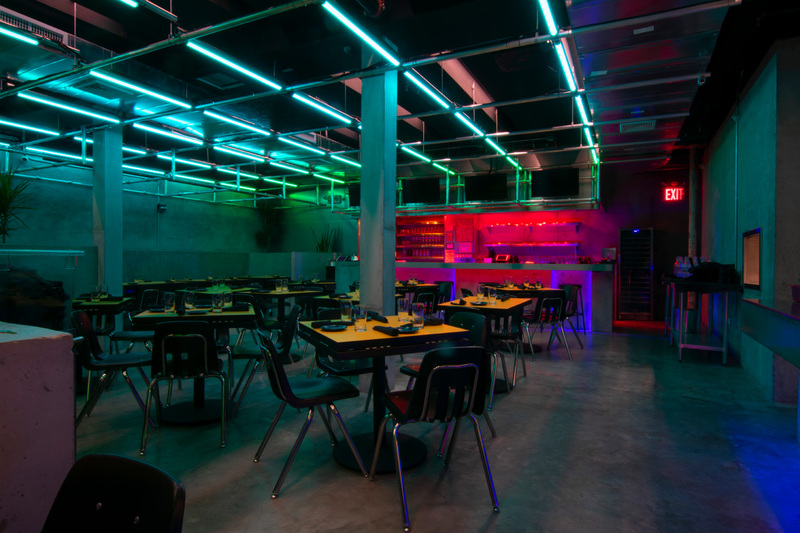 In both circumstances, Kaza Concrete assembled, designed, and fabricated the installations to highlight the possible layouts of GRT’s panels as well as the materiality of the manufacturer’s polished concrete. Notably, Kaza Concrete’s installation for the Milan Design Week was fashioned to resemble the base of a monumental column, laid out with a wildly irregular and fractured surface treatment. Flutes and Reeds has been on the market since June, and it is currently being incorporated into GRT Architects' design of a family home and studio in Duchess County and the renovation of a rectory in New York’s Harlem neighborhood. After the Brooklyn Navy Yard Development Corporation (BNYDC) revealed a $2.5-billion expansion plan for the Yard in January of this year, it became clear that, with all of the existing buildings renovated, the only place left to go was up. Now, the BNYDC has released a slew of renderings from the Yard’s master planners, WXY, and a guide to development in the waterfront campus for the next 30 years. How will the Yard add an additional 5.1 million square feet of floor space to the already built-out campus? The BNYDC will be building on three available sites along Flushing Avenue, Navy Street, and Kent Avenue, and to accommodate the wide, open spaces that industrial manufacturers require, will be leaning into a strategy of “vertical manufacturing.” Transportation upgrades for both those who work in the Yard and the general public, and wayfinding improvements, have also been included. The heavy commitment to vertical manufacturing—which places large, floorplate-spanning manufacturing zones at the base of each building, with packaging and offices above—is part of the Navy Yard’s commitment to bolstering industrial manufacturing. Of the 10,000 new jobs the expansion is expected to support, 75 percent of them have been set aside for manufacturers, with technology office space and service jobs expected to fill in the remaining 25 percent. The currently vacant Kent Street lot sits on the Yard’s northern corner, right off of the Barge Basin Loop inlet. Two buildings totaling 2.7 million square feet would rise on the waterfront, as well as a public esplanade where manufacturers could directly showcase their products. At the Flushing Avenue site, which is still partially owned by the federal government and sits on the southern portion of the Navy Yard near the recently completed Building 77, two more buildings will rise for another 1.4 million square feet of mostly manufacturing space. 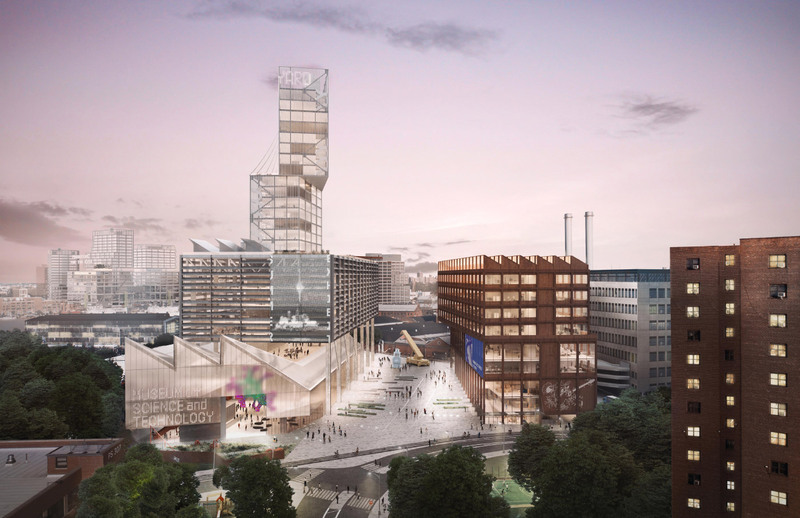 Both of these buildings, which WXY has designed with an industrial feel and linked with several sky bridges, have been tentatively planned for food manufacturing. The parcel could also potentially link up with a pedestrian flyway from the waterfront that would run through W9’s Dock 72 building and allow ferry passengers to walk over the Navy Yard to reach the street. The Navy Street lot, currently an NYPD tow pound at the campus’s Sands Street entrance, would hold two new buildings on either side of a public plaza. WXY and the BNYDC have proposed a possible public museum of science and technology for the larger building, with the other housing classrooms, STEM development programs, and workforce development space. The same saw-toothed roof profile was used for both Navy Street buildings in the renderings, but more importantly, none of the new proposed projects overshadow the existing developments. WXY has also proposed a “historic core” area for biking and walking, which truck traffic would be routed around. “Forward-thinking cities like New York are using urban design to grow districts that support new kinds of jobs in urban industrial and maker settings,” said WXY managing principal Adam Lubinsky, who also led the master planning team. “The Brooklyn Navy Yard is leading the way, showing how to create and integrate valuable public space and amenities, multi-modal transit and streets, and state-of-the-art vertical manufacturing buildings, which will boost the Yard’s economic impact.” Residents interested in touring the Navy Yard can do so on October 2, where David Ehrenberg and Claire Weisz will discuss the future of the 300-acre Yard. 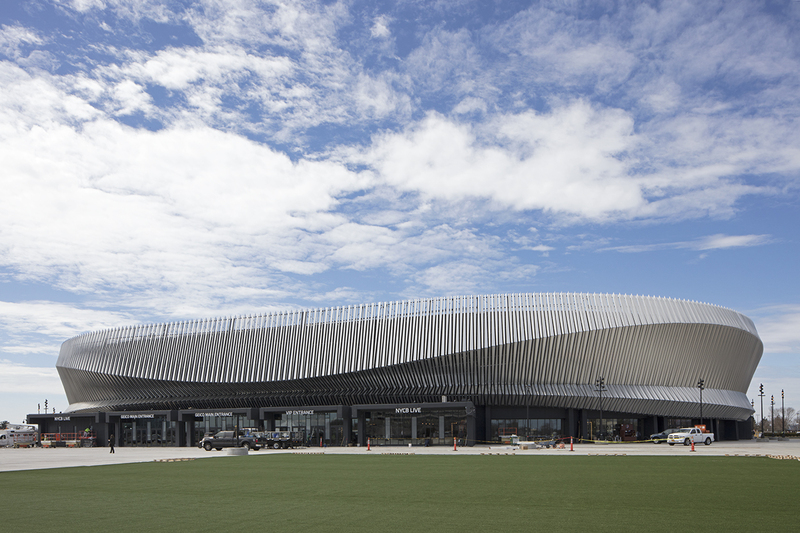 Tours of Building 77, New Lab, the BNY Bridge, and Dock 72 will also be available beforehand. For the first time in 35 years, the Brooklyn Public Library (BPL) is building a new branch dedicated to serving the communities in DUMBO, Vinegar Hill, and the Farragut Houses. 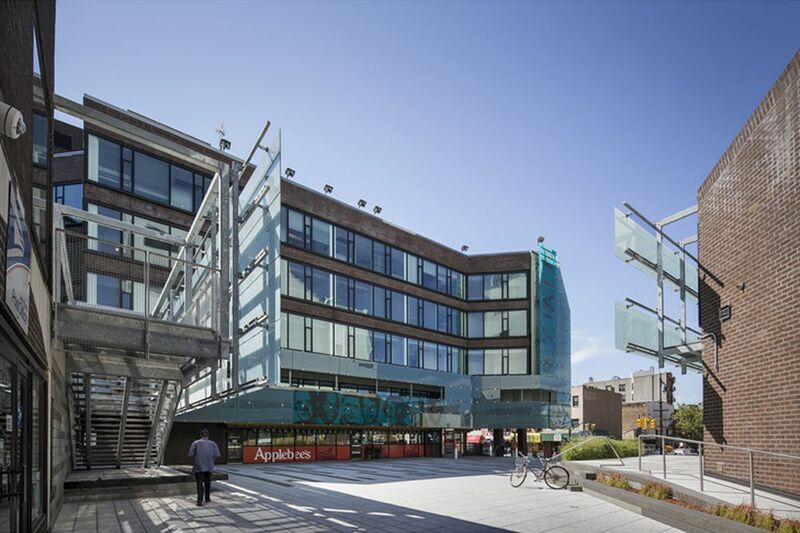 With a design by New York firm WORKac, the library is set to become the 60th branch in the system. So far, no design details have been announced, but WORKac will begin an extensive community engagement process this fall to determine the main design priorities for local residents. It will be located at 135 Plymouth Street—just underneath the Manhattan Bridge inside Alloy Development’s One John Street residential complex—and will feature 6,500 square feet of space for flexible programming, book lending services, and desks for working. The project is part of BPL’s major effort to update aging infrastructure in one-third of its branches over the next five years. Thirteen libraries will undergo full-scale renovations while three libraries (Brooklyn Heights Library, Greenpoint Library, and Sunset Park Library) will be entirely reconstructed. The newest branch in DUMBO is expected to be completed by 2020, with an estimated construction start in mid-2019. WORKac has a long history of working on public projects with the City of New York, including libraries, schools, and historic retrofits. 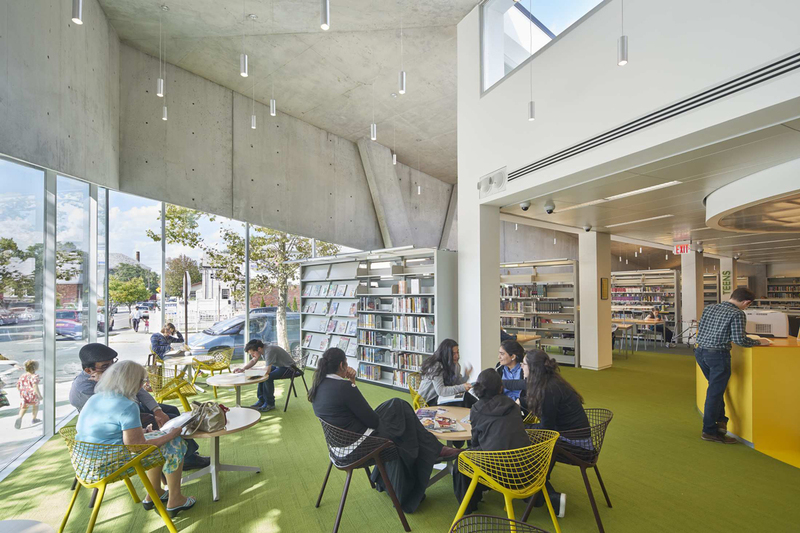 The firm finished the much-anticipated renovation and expansion of the Kew Gardens Hills Library in Queens last fall, bringing structural upgrades, a bright new interior, and an elongated green roof to the 10,000 square-foot space. In addition, WORKac designed the inaugural Edible Schoolyard for P.S. 216 in Brooklyn as well as the more recently-completed second schoolyard at P.S. 7 in East Harlem. New York YIMBY revealed this morning that a new development designed by DXA Studio is potentially in the works for Sunset Park. The 240,000-square-foot complex, likely mixed-use with residential and commercial components, will stretch between 7th and 5th Avenues at 6205 7th Avenue in Brooklyn. The upcoming site, spearheaded by New Empire Corp., will feature three mid-rise towers situated atop a platform covering the train tracks. The Hudson Yards-like vision for the project—albeit smaller as YIMBY notes—will bring a much-needed, massive new housing option to the borough’s southwestern industrial neighborhood. Renderings show that the structures will include a terraced design facing west towards the river with rooftop plazas dotted with greenery. On the east side, a lower-level, elongated structure runs two-thirds the length of the development while the taller towers jut out at angles facing south. The facades of each building appear to be clad in muted materials with big, boxy, recessed windows that allow ample light into the interior spaces. Close-up visuals detail the jagged shape the angular towers take on at the edges of the development. The architects told YIMBY that 6205 7th Avenue will house two blocks of retail, office space, restaurants, a gym with a pool, a hotel, community facilities, as well as public park space. Though the initial designs have been released, permits for the site have not yet been filed.